Offering accommodations that are spacious and welcoming, our historic mansion is an inviting alternative to hotel lodging, when visiting the Independence and Kansas City, MO area. All of our thoughtfully appointed guestrooms have queen beds, cable TV, individual heating/air conditioning systems, wireless Internet, iron and ironing board, extra blankets, and comfortable armchairs for reading or watching TV. Guests also are encouraged to enjoy the mansion’s common areas. The Music Room is named for the murals on the wall, hand painted by a friend of Lottie Gillmor in the 1950s. The room has an overstuffed loveseat, wingback chair and comfortable armchairs for visiting or reading. The four-season sunporch is wonderful for breakfast or relaxing with your traveling companions. The glass-topped table is perfect for a game of cards. Many peaceful evenings are spent by guests on the front veranda enjoying a glass of wine and unwinding after a long day traveling or sightseeing – or starting the day with a cup of coffee. This is also the place where hosts, Jim and Wendy, are known to take advantage of the rare evening off to relax and unwind. The dining room has a large oak table, which can accommodate the largest of domino games or rousing group of 6 for cards or other board games. For the business traveler, you are welcome to use the dining room for your planning session with clients or colleagues for the next day. Several other smaller tables are available for smaller groups or couples. The large front lawn will accommodate weddings or other events attended by 250 – 300 people. At the side of the main lawn is a cement patio under large walnut trees and bordered by more natural flowerbeds. Coffee, tea, soft drinks and water, as well as snacks, available on the 2nd floor common area landing. Full, hearty, home-cooked breakfast served each morning at your private table. Cancellations: (Pertaining to guestroom accommodations only) – All cancellations will be subject to a $25.00 cancellation fee. Cancellations can only be accepted fourteen (14) days in advance of your arrival date. Guests who cancel their reservations within fourteen (14) days of their arrival date will be expected to pay for their full reservation, regardless of arrival or departure. If we can rebook the room, your cancelled reservation will be applied, via a credit towards a future stay, less the $25.00 cancellation fee. Credits for future stays are good for one year from date of cancellation. There are no refunds for early departure or non-arrival. When reservations are confirmed, all other requests for that room are turned away. As a small business, cancellations have a significant impact on our business. Our guests expect and enjoy outstanding hospitality with high standards of quality. To this end, we must adhere to a strict cancellation policy without exceptions. 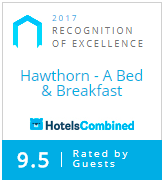 Self Cancellations: If at the time of check-in, it is deemed by the innkeeper that the guest or any member of the guest’s party who is staying at Hawthorn is intoxicated and/or unable to conduct themselves in a safe manner such that in the sole interpretation of the innkeeper the guest would or will pose a danger to themselves, other guests or Hawthorn property, the Innkeeper may refuse to allow the guest and their party to check-in. The guest will be considered to have self-cancelled the reservation and will be responsible for the full cost of their complete reservation. A self-cancellation is the same as a cancellation under Hawthorn House Rules as here stated. Smoking: City ordinance does not permit smoking inside the mansion. Please use the designated outside areas and containers. (note the placement of a cigarette disposal unit across the driveway on the northeast corner of the estate grounds) Smoking is specifically prohibited in the mansion, on the patios, porch or walkways and within fifty (50) feet of any mansion entry door. There will be a $250.00 charge for violation of the smoking policy. Extra Persons: All tariffs are based on 1 or 2 persons. There is a $25.00 extra person fee, per person, per night in rooms which can accommodate 3 or 4 guests. Facilities: In addition to your private room, we encourage you to use the living, dining and music rooms, sun porch, front patio porch, and estate grounds. Food Services: Please notify the hosts if you have any special dietary requirements. Red wine is specifically prohibited inside Hawthorn B&B. This includes the common areas and guestrooms. In addition to the cost of replacing stained/damaged linens, furnishings or floor coverings, there will be a $250.00 charge for violation of the red wine policy. You are welcome to enjoy red wine on the patio and estate grounds. Children: Due to the historic nature of the mansion and its furnishings, children under the age of twelve (12) are not allowed as overnight guests. Check-In: Check-in time is 4pm to 6pm. Please note: We do not check-in guests after 6:00pm. Early check-ins are welcome whenever possible. Please call ahead if wishing to check-in prior to 4pm. Check-out: Check-out time is 11am. Quiet Time: As a courtesy to all our guests, we ask our guests after 10:00pm to refrain from loud conversations and minimize noise when entering and leaving guestrooms. Guests are always welcome to utilize our beautiful first floor Dining Room, Sun Porch, Music Room and Parlor. Payment: We accept Cash, Personal Checks (with I.D. ), MasterCard, Visa, American Express and Discover. I promised my friends elegance, relaxation, superb food and charming hospitality…and you delivered! Thank you for opening your home and hearts to us.